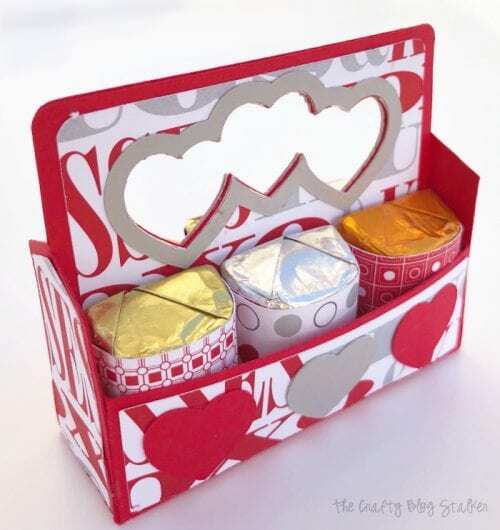 Learn how to make a chocolate Nugget 6 Pack and how to upload a cut file into Cricut Design Space! 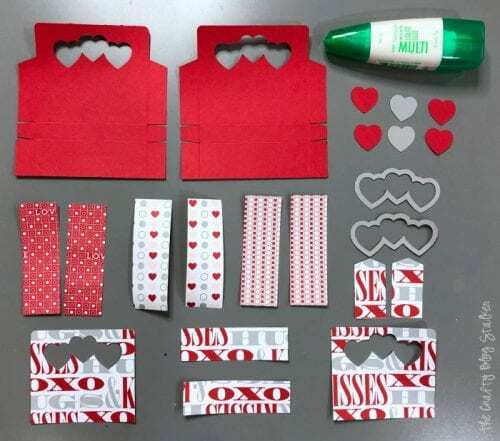 Easy DIY Craft Tutorial Idea. 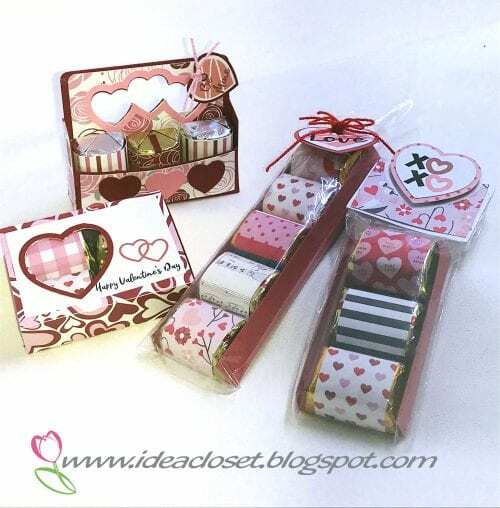 Do you love to give little handmade gifts on Valentine’s Day? I do too and these Nugget 6-Packs are perfect!! Aren’t they just so stinking cute?! 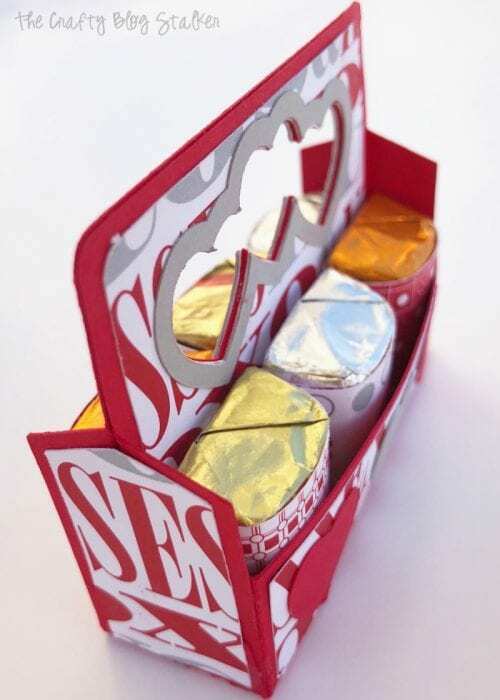 This Hershey Nugget 6-Pack cut file comes from Paper Closet Designs. You should totally go give this site a browse, her cut files are so cute and can be cut out on any cutting machine! The possibilities really are endless with Cricut! 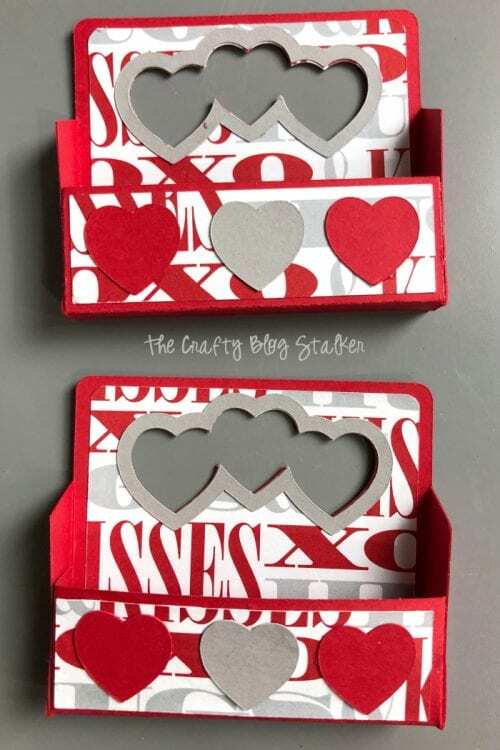 You can purchase cut files created by just about anyone and upload them into Cricut Design Space to be cut with your Cricut Cutting Machine. Isn’t that awesome? 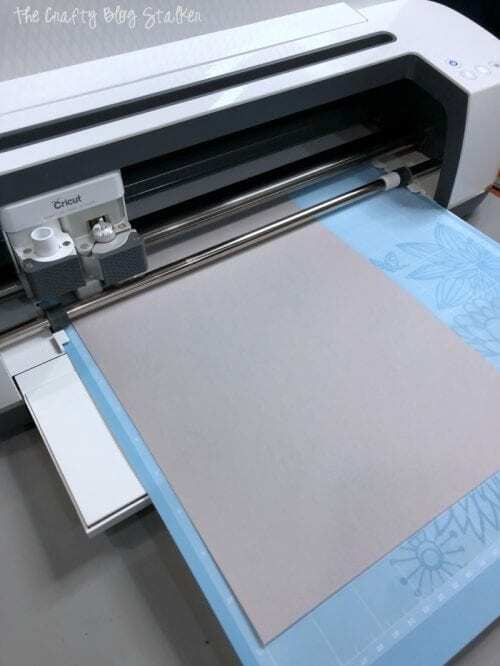 When purchasing a cut file from a private party, make sure they have the file format of .jpg, .gif, .png, .bmp, .svg, or .dxf files because these are the type of files that can be used with Cricut Design Space. Paper Closet Designs goes a step further and has a file labeled just for Design Space which makes them even easier to upload and work with! If this is your first time uploading a cut file, I’ve got you covered. I created a video just for you!!! Even if you are uploading a cut file by someone besides Paper Closet Designs the process should be the same. Easy Peasy! 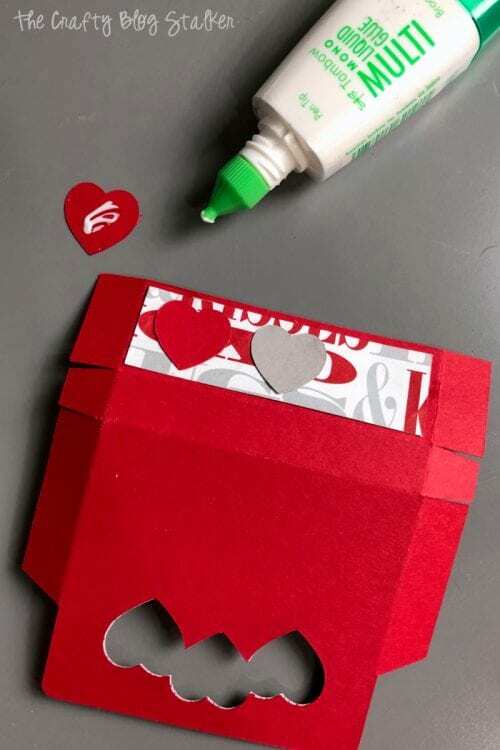 I cut this out on my Cricut Maker, but since cardstock can be cut on any Cricut Machine, as long as it connects to Cricut Design Space you are good to go! Now that we have the file all cut let’s assemble! All of the pieces look small, but don’t worry, they are the right size. It’s a small 6 pack! Begin with the base pieces of the box and fold at the score lines. On the side with folds coming in, adhere the top pattern piece to the base. It lines up quite easily when you use the triple hearts as a guide to align the pieces. 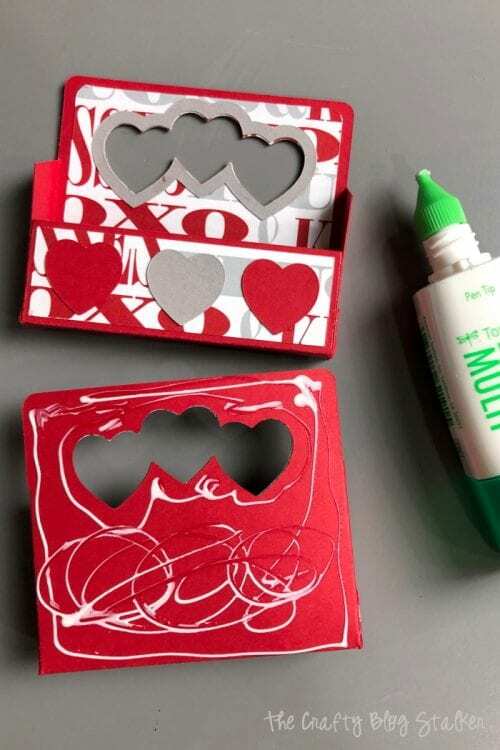 Then glue the triple heart outline into place. 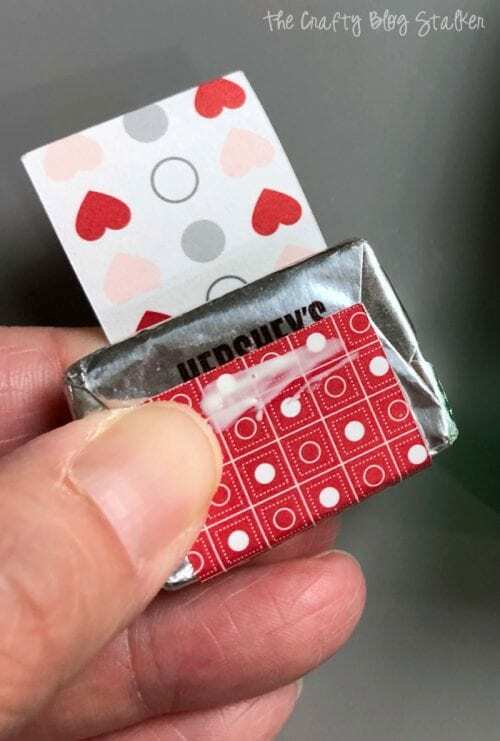 Turn the piece over and with the triple hearts upside-down, glue the rectangle cover and three hearts into place. Now begin assembling the box. Apply a bit of glue to the shorter side flap. 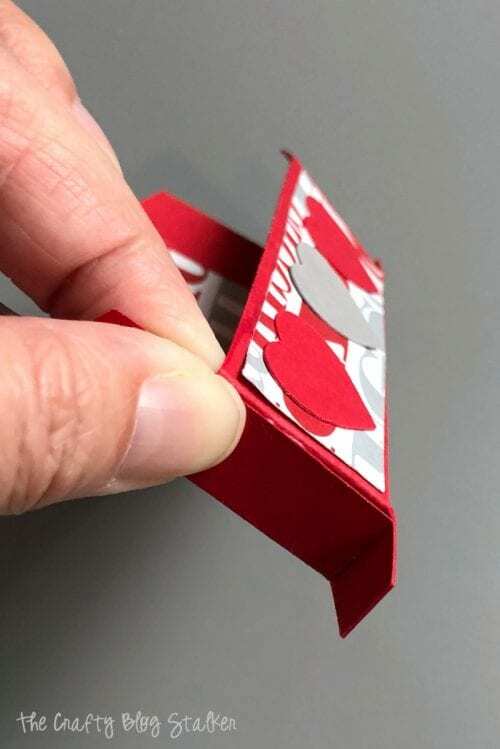 Fold into place to make a box and pinch in place till the glue is set. 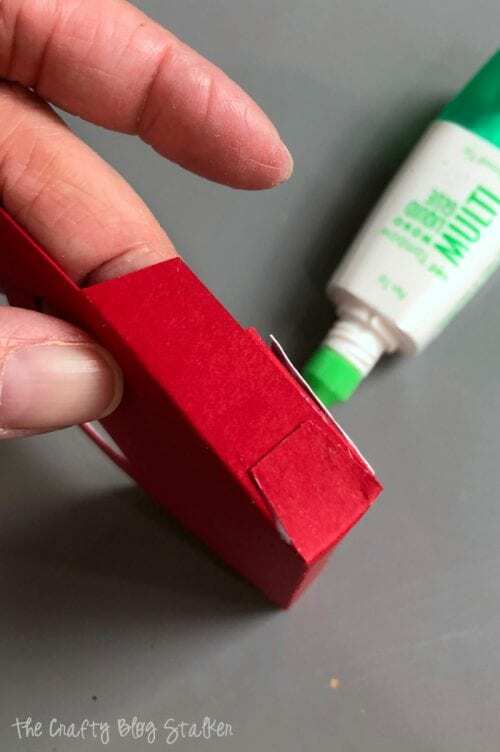 Add a bit of glue to the little flap and pinch it up into place. There are two sides to this box, so repeat the steps above to create the second half of the box. 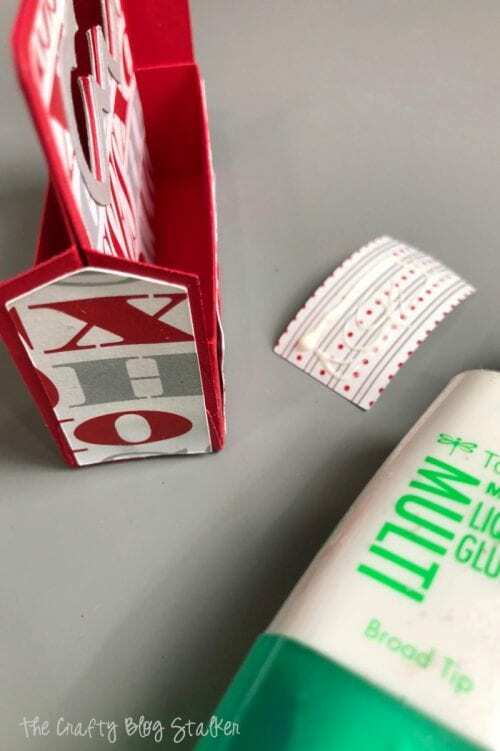 On the back of one of the boxes apply a squiggle of glue and align the back of the boxes together. Again, use the triple heart cut out to help align. 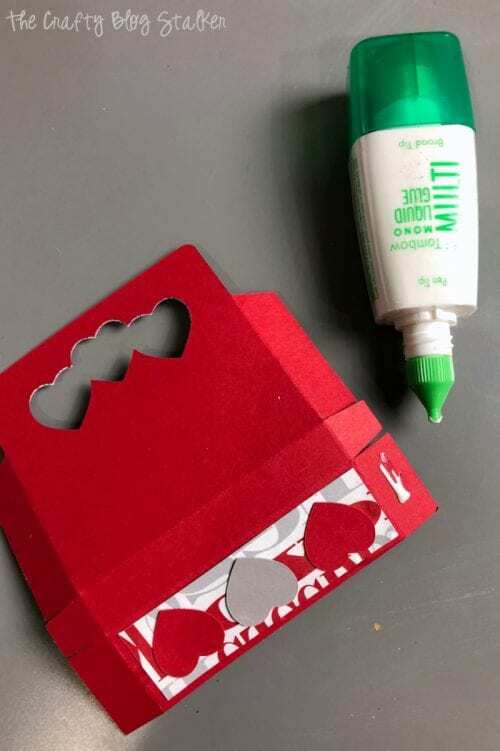 Apply glue to the end pieces of the pattern paper and apply to the ends of the box. This will cover the little flaps. All thats left is to cover the Hershey Nuggets! 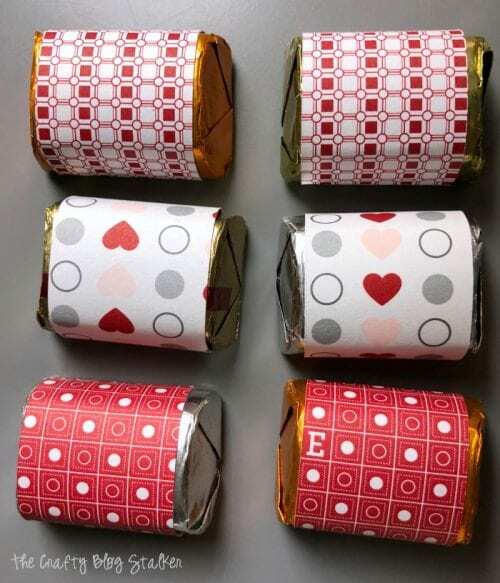 Wrap a pattern paper piece around a nugget and apply a thin line of glue along the bottom. 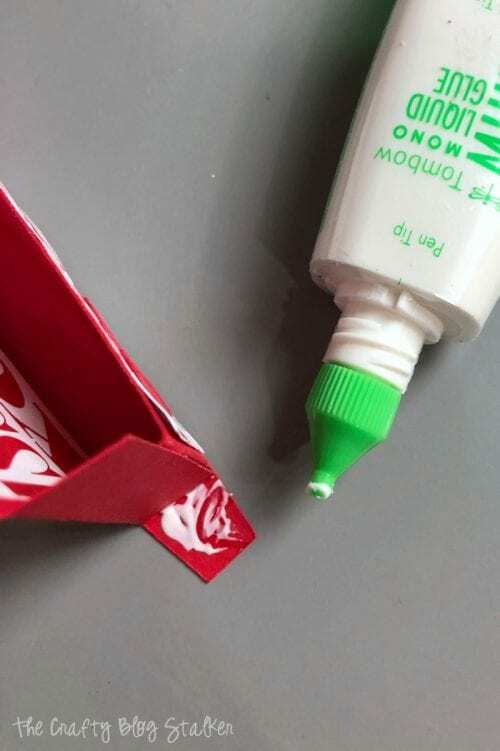 Then wrap the other side over and press into the glue. Place the little nuggets into the 6 pack tote and you are done!! Aren’t they cute? … for that special someone! 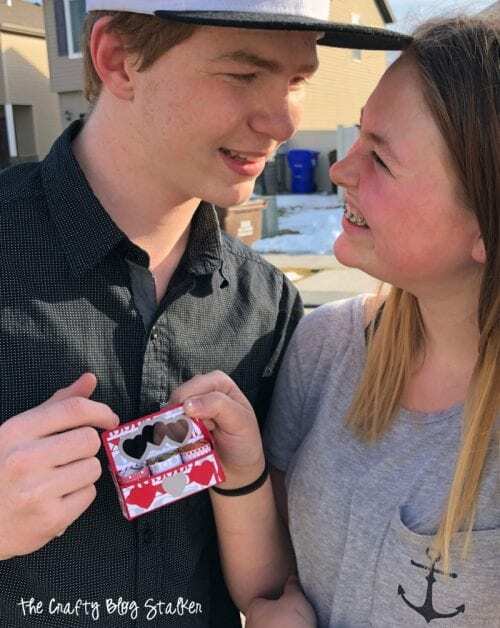 Who wouldn’t want chocolate for Valentine’s Day? Who would you give your Chocolate Nugget 6 pack too? Share and leave a comment below! Visit Paper Closet Designs on Etsy, the Blog, or YouTube! 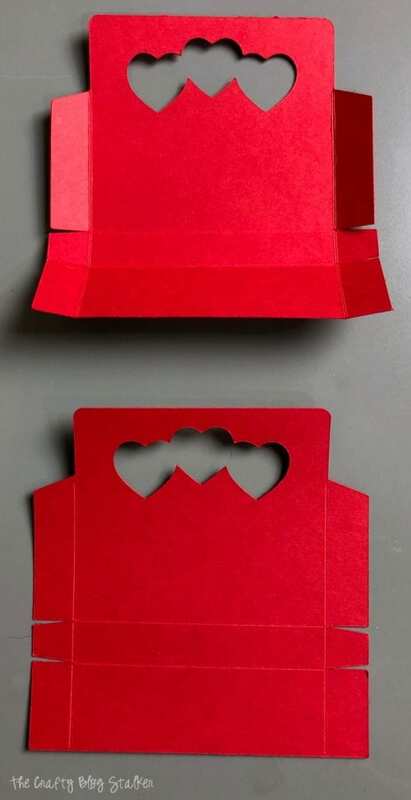 There are even more Hershey’s Nugget Valentine’s Day Ideas! 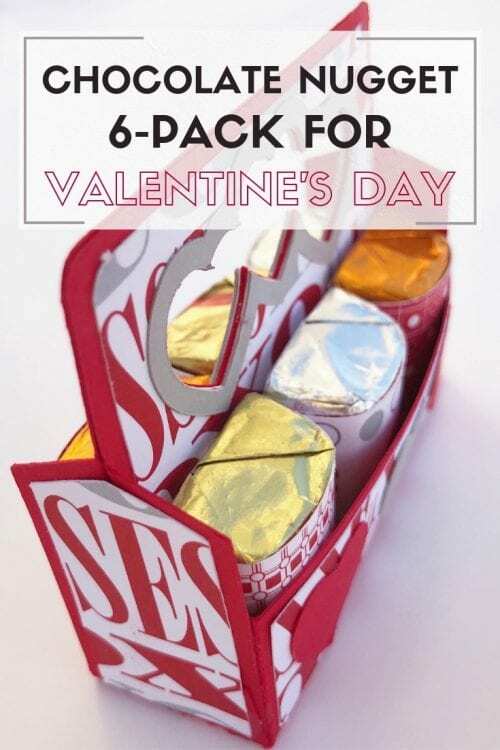 SAVE HOW TO MAKE A CHOCOLATE NUGGET 6 PACK FOR VALENTINE’S DAY TO YOUR FAVORITE DIY PINTEREST BOARD! Thank you Katie! Love your tutorial. Your little 6 pack turned out so cute!! !